"28 And just as they did not see fit to acknowledge God any longer, God gave them over to a depraved mind, to do those things which are not proper, 29 being filled with all unrighteousness, wickedness, greed, evil; full of envy, murder, strife, deceit, malice; they are gossips, 30 slanderers, haters of God, insolent, arrogant, boastful, inventors of evil, disobedient to parents, 31 without understanding, untrustworthy, unloving, unmerciful; 32 and although they know the ordinance of God, that those who practice such things are worthy of death, they not only do the same, but also give hearty approval to those who practice them." And that paints a perfect picture of The Newtown Shooter specifically Verse 29 and 30 "Being filled with all unrighteousness, wickedness, greed, evil, full of envy, MURDER, strife, deceit, malice, they are gossips, slanderers, haters of God, insolent, arrogant, boastful, inventors of evil, DISOBEDIENT TO PARENTS. And what better way to disobey your parents than by killing them? But we still ask why? Why did such a horrible thing happen? How could such a horrible thing happen? We forget that we are living in a broken and fallen world. Things are NOT the way they should be, Genesis 3 makes that clear.We're living in a world damaged by Sin. When we say "Sin" most people think of murder and a bunch of other stuff, but people don't think about the issues that occur from sin, specifically such things as disease, mental illness and so many other things DID NOT exist in the world God intended for us. Because of the actions committed in Genesis 3, those ills were released upon the world and because of such ills, mentally unstable people get a hold of weapons and children die. We as Christians have to be mindful that though this is a horrible tragedy, it is not unique, atrocities of the like have been committed throughout history, Slavery, The Holocaust, Pol Pot, The Armenian Genocide and MANY, MANY OTHERS! 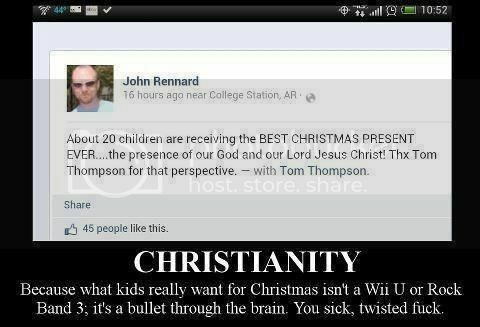 And while the world wants to blame society, blame mental illness, and so on...we Christians know that Sin is to blame. Unfortunately The Media does not help in these matters, with 24/7 round the clock coverage of the aftermath, reenactments, a chronicle of the Shooter's moments leading up to the murders, his name and face posted everywhere and a constant mention of the body count, we almost forget that we're talking about actual people who were living and breathing and not just a jumble of names and numbers on the bottom of a newsfeed. The lives that are effected by this tragedy extend far and wide beyond those who lost loved ones, but to the marriages that will no doubt end in light of this tragedy, the children who lose their friend at such an early age and have to come to grips with the concept of death before they can even spell the word properly, and of course the remaining family and friends of The Shooter who are no doubt questioning if they could have done something to nip this problem in the bud. The News Media is causing a ruckus about Gun Control, a debate that's been heated since The Columbine Shooting, and while I am not in favor of disarming the citizens, it is no doubt hard to debate the topic in light of recent news. These are all very important topics that must be addressed when cooler head prevail, but in the meantime we as Christians must be ready to express our faith in situations such as these because it is THESE situations in which our faith is tested. We are called to "weep with those who weep" and while not all of us may shed tears, our thoughts and prayers should be with them and they are (speaking solely for myself). Todd Friel is a jovial fellow, but joviality aside, for Christians, THIS IS A WAKE UP CALL for us to get out in the mission field and start talking to our friends and loved ones about these things. It's to test our faith and call us to task on whether or not we truly believe that Jesus died for our sins and rose on the 3rd day or are we merely paying lip service. If any non-believers are reading this, I understand this article is written with no clear direction and may not win you over with a solid argument or provide any comfort...but I just felt the need to write this and express my feelings, as unclear as they are on this matter. provided below are links to Dr. Albert Mohler's website where we has written a much more poignant article with a clearer message. Peace in Christ all.